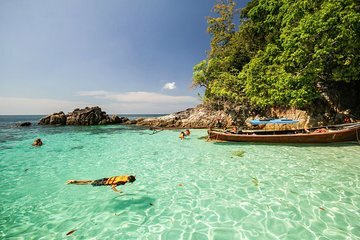 Immerse yourself in the natural environment of Tarutao National Marine Park on this full-day tour from Koh Lipe. With a guide in the lead and a carefully curated itinerary, you'll be sure not to miss a thing. All snorkeling equipment and instruction is included to explore the underwater world of Koh Jabeng, filled with soft corals and tropical fish. A longtail boat will take you and your group to relax on the white sand beaches of Koh Rawi and take in the perfectly round stones on Koh Hin Ngam.